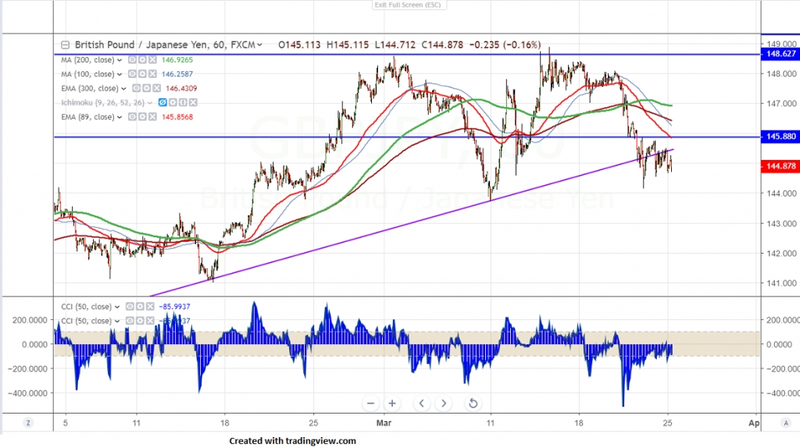 GBPJPY is consolidating within narrow range after hitting low of 144.13. GBP was trading higher against all major especially with USD and jumped sharply till 1.3200 amid Brexit pessimism. But yen holds strong on declining bond yield and US 3 month trades above 10 year yield for first time since 2009 (inverted curve). The pair hits intraday low of 144.66 and is currently trading around 144.97. On the lower side, near term support is around 144.70 and any violation below will take the pair to next level till 144.13/143.75. The near term resistance is around 145.25 (23.6% fib) and any break above will take the pair to next level till 145.50/146. It is good to sell below 144.70 with SL around 145.25 for the TP of 143.65/143.